Re-inventing the veggie option: Think of a boring, bog-standard veggie option like nut roast or risotto and give it a makeover. It is, perhaps, one of the most dispiriting events to experience while dining out as a vegan. You’re at a restaurant that touts itself as vegan-friendly. The menu arrives, and your eye runs down the page, looking for that familiar V or a little leaf-shaped icon. Finally, towards the end of the list, you find the mark… only to see it paired with an abysmally un-creative item. It’s a portobello mushroom wrap or penne with red sauce or, alas, a roasted veggie wrap. You sigh and order it anyway. We’ve all been there, right? We’ve all put on a smile when facing the waiter or our omnivorous dining companions, pretending we’re totally fine with the laziest and most boring vegan option imaginable. But inside, WE ARE NOT FINE. Is it too much to ask for a creative, thoughtfully prepared and executed vegan dish?! When the internet and hundreds of vegan cookbooks are bursting with inspiration, it’s disappointing that chefs and restaurant owners rely on tired veg staples from the ’90s. Now, let’s be clear: This does require a bit more work than dumping some hummus on a tortilla, stuffing it with quick roasted veggies and calling it a day. But each element is relatively simple to pull together, and you can make any of them ahead of time to assemble on the fly. (The flatbread wraps are best fresh, however!) Eat it hot, warm, cold, or anywhere in between, and up the harissa content to meet your personal spice threshold. First, make the slaw. Mix the shredded cabbage with the salt, sugar, and lime juice, and use your hands to coat thoroughly. Set aside while you prepare the rest of the ingredients. Next, prepare the veggies. Put the sliced peppers on a baking sheet, then drizzle them lightly with oil and sprinkle with salt. Whisk the tahini, harissa, and lime juice in a small bowl, and then toss this mixture with the cauliflower in a larger bowl. Pour onto a prepared baking sheet (either lightly sprayed with oil or lined with parchment). Put both pans or trays of veggies into the oven and roast for 25 minutes, stirring occasionally. While the veggies are cooking, prepare the flatbread. In a large bowl, mix the dry ingredients (flour to salt). Whisk together the aquafaba, milk, and oil in a smaller bowl, then add to the dry ingredients. Using a wooden spoon or spatula, mix the wet into the dry until combined, adding extra flour if the mixture is sticky. Dump the dough onto a floured surface and knead a few times. Divide the dough into six balls. Pour a little oil into a nonstick or cast-iron pan and heat it to medium-low. When the pan is heated, add the first flatbread and cover the pan. Cook for 2-3 minutes, until the pan is steamy and the bread has a few bubbles. Remove the cover and flip, cooking the other side for another 2-3 minutes until cooked through. Repeat for the remaining flatbreads. 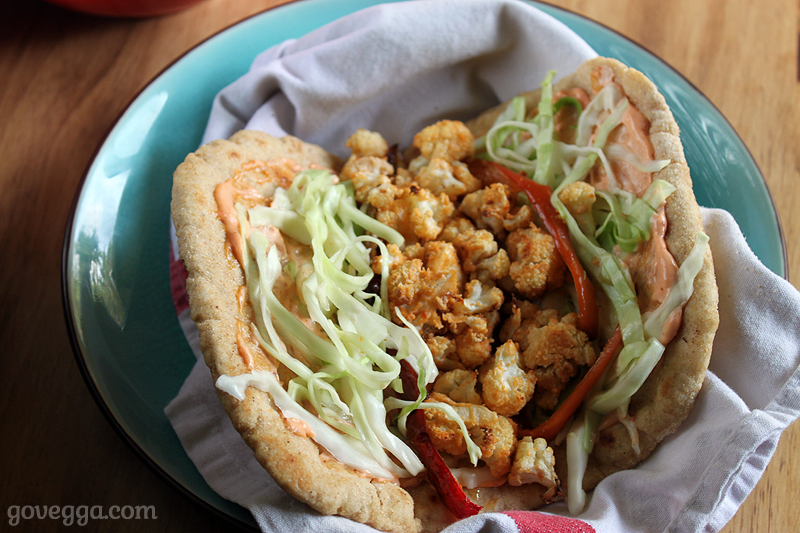 When all flatbreads are cooked, mix up mayo and harissa to taste and assemble your flatbread sandwiches. Start with a layer of harissa mayo, then top with the lime slaw. 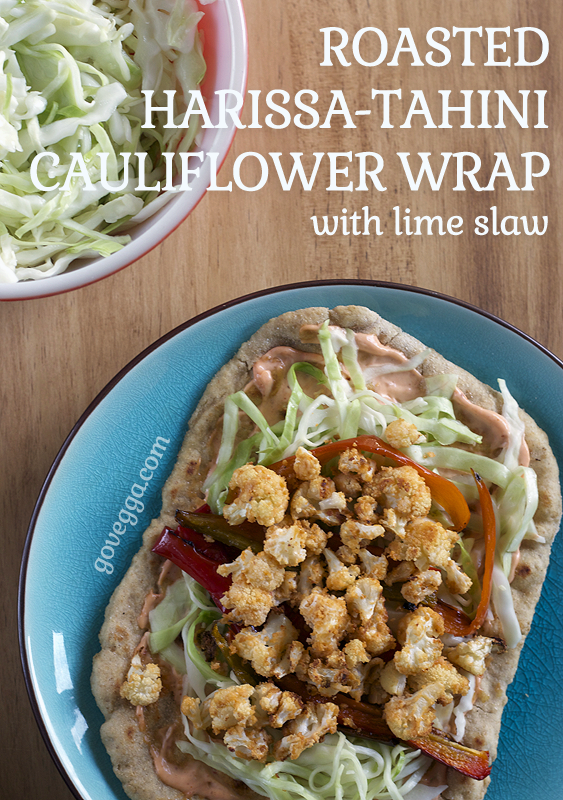 Add roasted peppers and cauliflower, gently fold the flatbread, and eat! Editor’s note: This post includes affiliate links. If you purchase something through my link, it costs nothing extra for you, but I get a few pennies to help cover hosting costs. I would be very excited to see this on a menu – much better than the ubiquitous hummus and roast veg! Yeah! I understand that hummus and veggies are easy to throw together, but at least do something creative with them! No shame in using a store-bought flatbread!